That’s right. The humble rice bin. Both of my children had a rice bin of their own, and it was nothing more than a long Rubbermaid bin full of white rice. And they would sit for hours and hours and hours, pouring all that plain, white rice into spoons and cups and funnels. But this is 2013, people. 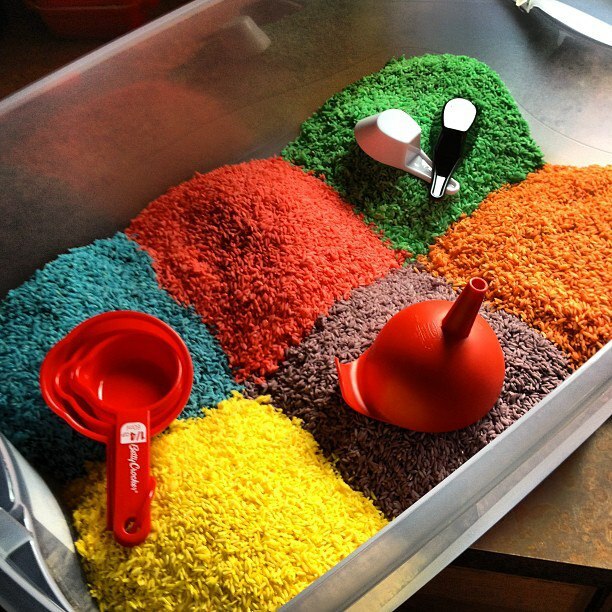 And it’s time to jazz up the rice bin. 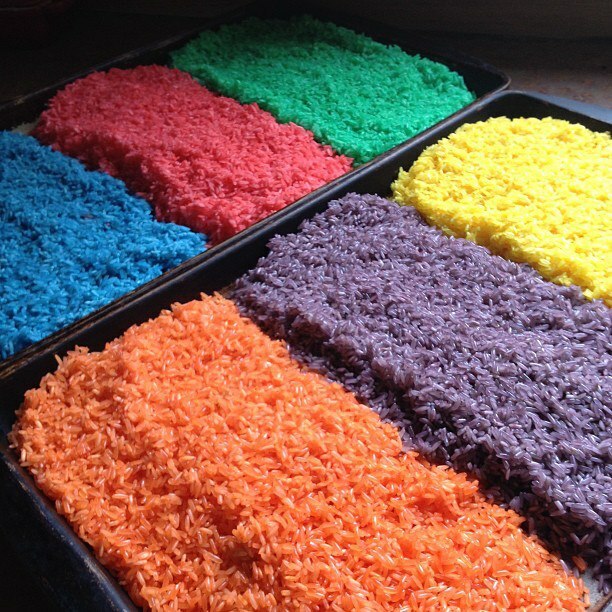 So, may I present to you … (insert drum roll here) … RAINBOW RICE! This is not my invention. This is all over the internet. But here’s what I learned this week making a big batch for my grandson, Gage. *Note: I used a mason jar with a white plastic lid. I do a lot of canning, so I bought “caps” that you can put on instead of having to put the lid and ring back on every time you want a single pickle. You can find them in the canning section. 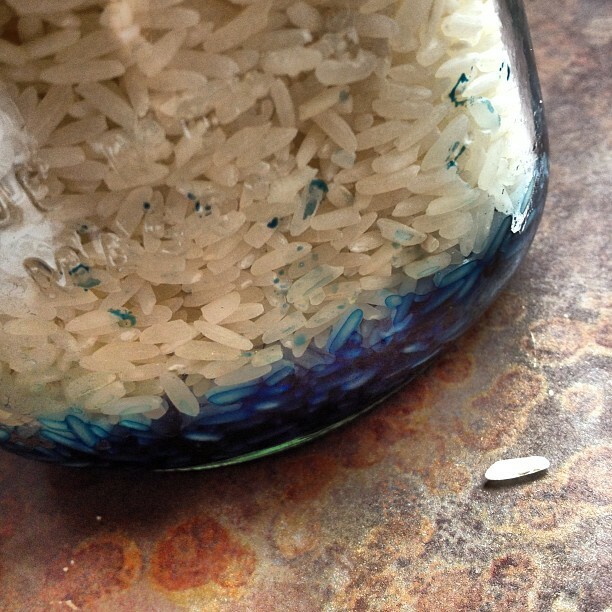 But if you don’t feel like buying caps, or you don’t have a mason jar, you can mix the rice in a large ziploc baggie. I just think that’s going to be a messier way to go. 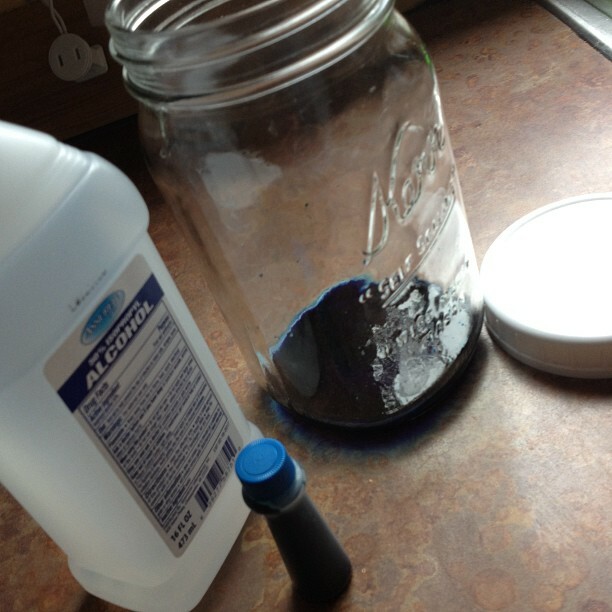 Pour a little of this in the bottom of the mason jar (I’m going to assume you’re using a jar. If you’re using a baggie, just make it work for you that way). Add 1 cup of rice. Pour a little more of the food coloring mixture over that. Add 1 more cup of rice. Pour the last of the food coloring over that. Cap and shake well. 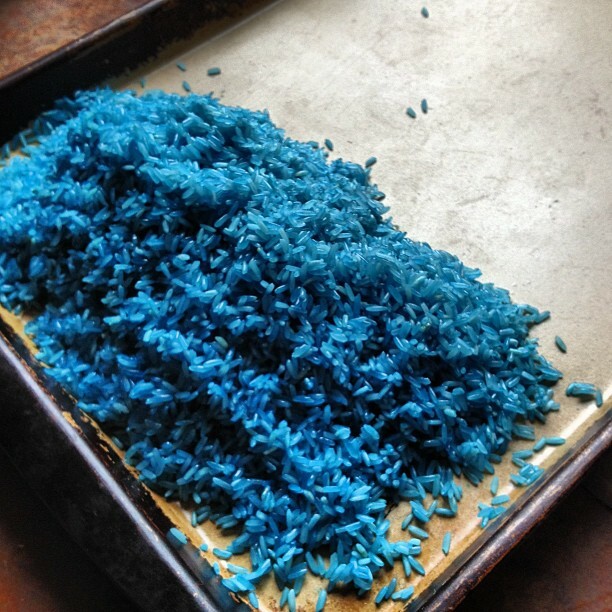 Once the color is all through the rice, pour out on a baking sheet. 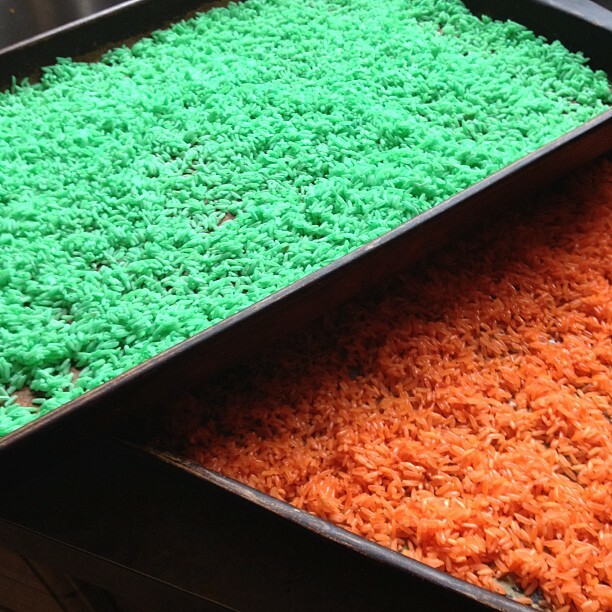 If you’ve got three big mounds of color, the way I did above, you’ll need to bake about 30 minutes on 200, or until the rice is dry. If you spread out 2 cups of rice on a baking sheet, the way I did below, you’ll only need 15 minutes on 200. For my sized bin, 2 cups of 6 colors wasn’t enough, so I went back and made another 2-cup batch of each. This means my 35-quart bin holds 24 cups of rice. You’ll want to assess it as you go and see how much rice you need to color for your bin. You can always add plain white rice to fill it up later. And here’s Gage, dumbfounded as to why we are letting him — no, encouraging him — to play with this mess-inducing substance. And while we’re on the subject of “mess,” do you mind if I give you a perspective from this side of my life? 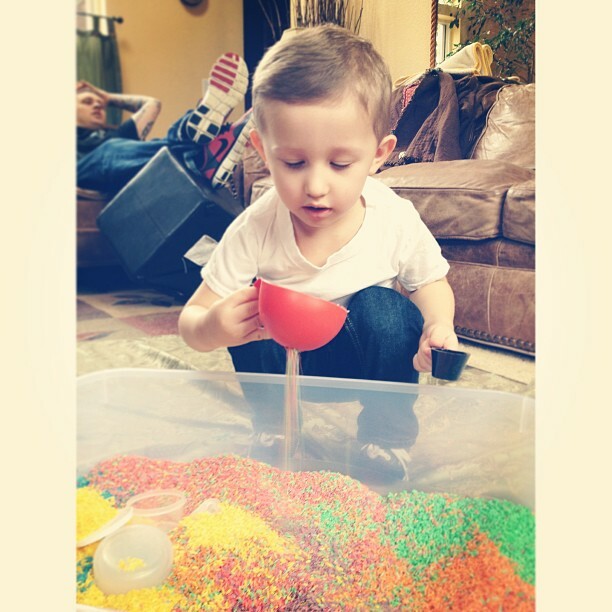 I watch my beloved son and daughter-in-law while Gage is playing with the rice, and I (we) know what they’re thinking. They’re very thoughtfully thinking that they don’t want to leave a mess for me. But it’s just not possible to let him enjoy that rice and not expect a mess. Sometimes he takes handfuls and just throws them across the room. I laid a tablecloth on the floor under the bin, thinking it might help. Hahahahah! Not so much. I think I’ve swept and vacuumed more in the past week than in the past year. 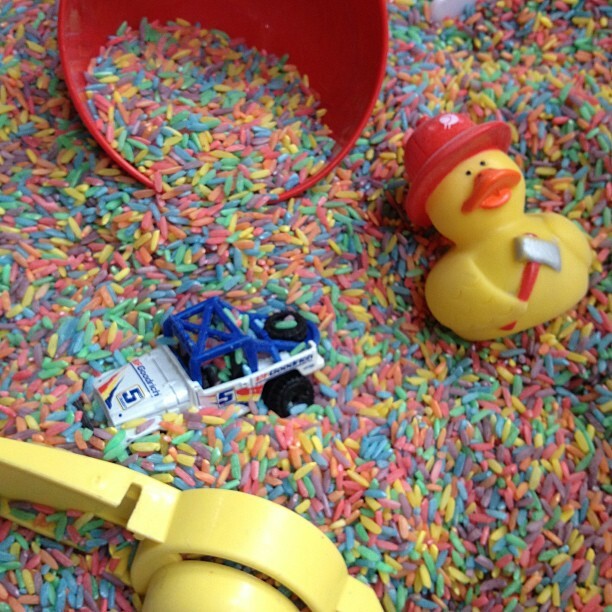 If the president is coming to your house for dinner tonight, then, you know … maybe today isn’t a great rice bin day. But on any other day, let it fly. While you’re watching the developing mess, tuck the memory away. You’re going to need it later.